Spain’s political leaders have been reacting to President Obama’s comments this morning. 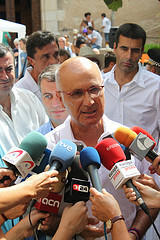 Josep Antoni Duran i Lleida (pictured), spokesman of the CiU in Congress, has been particularly outspoken about his views on the US premier’s earlier remarks. President Obama’s suggestion that Spain was the Eurozone’s next big problem was “not the most responsible thing to do,” Duran said this afternoon. The spokesman for the PP in Congress, Soraya Sáenz de Santamaría, was less critical of Obama, although politely reminded him that those in glass houses shouldn’t throw stones. She said: “In the PP we want Spain to turn the page on the convulsions and uncertainties that we have been living through these past months, and I imagine that Mr Obama himself wants the same for the United States”.